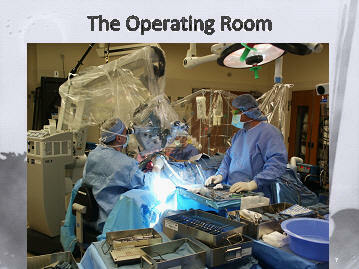 The operating room can be an intimidating and mysterious place for a patient. With a bit of information about the neurosurgical operating room, the room will seem less intimidating, and the patients will understand what is involved in a complex neurosurgical procedure, and what is involved in operating upon the brain and spine. Above, Dr. Kraus is seen performing an operation on the brain. A scrub nurse is assisting him, by passing him the sterile surgical instruments which he needs to perform the operation. Dr. Kraus is wearing a surgical gown, which he puts on after undergoing a scrub at the sink outside of the room. 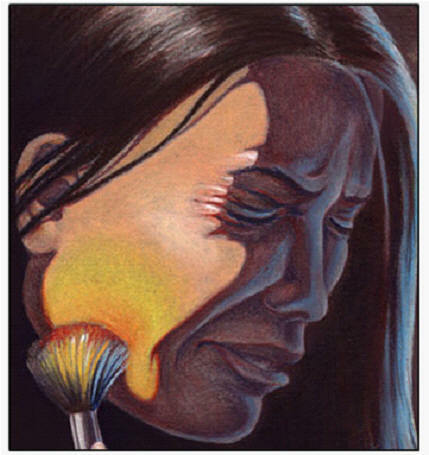 The surgical scrub allows him to sterilize his arms, from the hands to the elbows. After scrubbing at the scrub sink, he then enters the operating room, and the scrub nurse holds out the sterile gown, which he puts his arms into. A non-sterile circulating nurse then ties the gown in the back, while the scrub nurse helps the surgeon put on his sterile gloves. Dr. Kraus wears two pairs of gloves, which provides additional protection for the patient, and for himself. After putting on sterile gown and gloves, the surgeon approaches the patient, who has been positioned in the appropriate manner for surgery on the brain or spine. The neurosurgeon (spine surgeon) then places sterile drapes on the patient, which provide a sterile field in which to perform the operation. In the photograph above, the operating microscope is seen, draped in a sterile manner, with a sterile plastic covering. The operating microscope will allow the surgeon the ability to magnify small fields of interest during the operation, as well as provide light in small cavities, and allow the surgeon the ability to see in stereo 3-D vision, through a small opening. Often, this third but important feature of the operating microscope is not appreciated. A neurosurgeon or spine surgeon, uses many instruments during the operation. Some are big, such as drills, retractors, chisels, oesteotomes, and mallets, and some are extremely small and delicate, such as micro scissors, micro pickups, and small suctions. While larger instruments may be used to remove bone and open bone (such as removing the lamina or back of the spine, or opening the skull), the smaller instruments will be used when operating around the nerve roots). 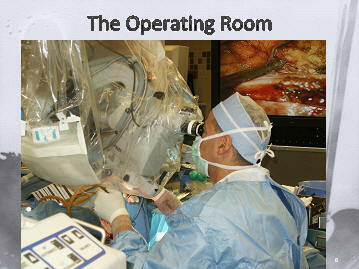 In the photograph above, Dr. Kraus is seen sitting in an operating chair, designed for the neurosurgery operating room, while operating upon the brain. Above and to the right, the image which he sees under the microscope is seen on the plasma television screen. The difference is that the plasma television screen provides a 2-D view, while under the microscope, Dr. Kraus is able to visualize, in 3-D, the anatomy of nerves and blood vessels before him. On the bottom right, a laser is seen, which in this case, is attached to the operating microscope, allowing Dr. Kraus the ability to focus the laser under the microscope, in order to burn out or vaporize tumor. 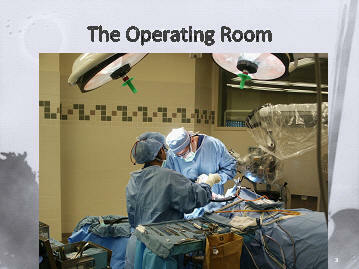 In the photograph above, the operating room is seen once again. Dr. Kraus is sitting in the operating chair, looking at the brain under the microscope. A scrub nurse is seen standing to his right, and in the background, behind a sterile clear barrier, the anesthesiologist is providing the needed anesthetics (medications and gas) which will allow the safe performance of the operating, while the patient is asleep. These anesthetics will allow the patient to have the procedure done without the patient feeling any pain, and will also ascertain that the patient will not remember any of the operation, and will, when necessary, keep the patient's muscles relaxed. In the operating room for surgery of the brain or spine, monitoring of the electrical activity of the brain, spinal cord and nerves are often performed. 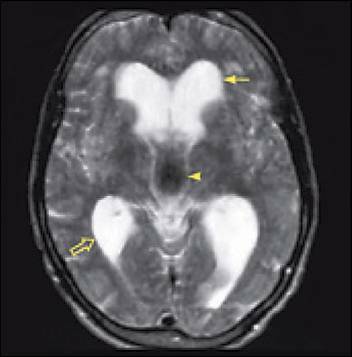 This is done with EMG (electromyogram), EEG (electroencephalogram), SSEP (somatosensory evoked potentials), MEP (motor evoked potentials), and BAER (brainstem auditory evoked potentials). Monitoring of these electrical activities helps the spine and brain surgeon the ability to constantly monitor the functioning of critical neural pathways, with the goal of making the surgery on the spine or brain as safe as possible. In order to perform EMG (electromyogram), EEG (electroencephalogram), SSEP (somatosensory evoked potentials), MEP (motor evoked potentials), and BAER (brainstem auditory evoked potentials) on a patient who is asleep under anesthesia, special combinations of anesthetic gases and infusions must be used. The use of EMG (electromyogram), EEG (electroencephalogram), SSEP (somatosensory evoked potentials), MEP (motor evoked potentials), and BAER (brainstem auditory evoked potentials) during an operation on the brain and spine help to enhance the safety of the procedure, by alerting the surgeon for changes from the baseline values. Sometimes these changes may be a result of other factors encountered during the operation, and the surgeon must assimilate all of the information he is confronted with, and in the end, use his best surgical judgment and clinical skills in determining what is best for the patient. EMG (electromyogram), EEG (electroencephalogram), SSEP (somatosensory evoked potentials), MEP (motor evoked potentials), and BAER (brainstem auditory evoked potentials) are very useful for surgeries on the nerves in the spine, for tumors in the spine and brain, and for spinal fusions. 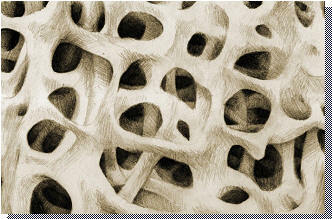 Another device, which is frequently used in the operating room for surgery on the spine, is the cell saver. This is a device which allows the surgeon the ability to reprocess the patient's own blood, which is lost during the operation, and give it back to the patient. This is safer than giving the patient a blood transfusion with the blood from donors. In the operating room for surgery on the spine, the cell saver is connected to the suctions which are used by the spine surgeon during the operation. The blood is collected in containers of the cell saver, and then processed and given back to the patient. The cell saver reduces the need for blood transfusions during or after surgery on the spine. For surgeries of the spine related to tumor or infection, the cell saver would not be used, because of the risk of spreading the tumor or infection throughout the body.